The dictionary tells you a violent temper is a character flaw because it affects the person’s actions. 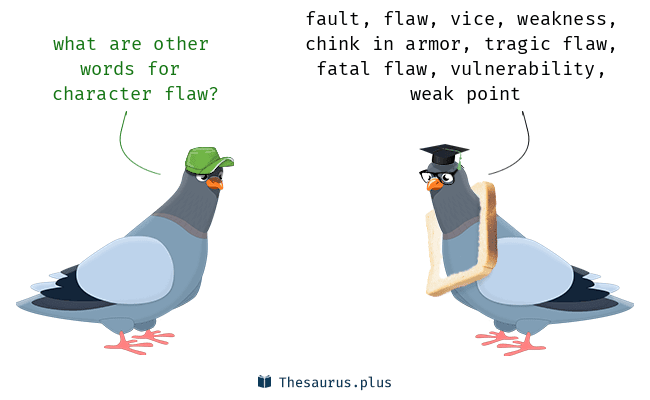 So a flaw is something of an imperfection, a limitation. If you look at Shakespearean heroes, each of them had a distinctive flaw that defined them and ultimately, destroyed them. Othello was suspicious, Hamlet indecisive and King Lear loved flattery. One of my character flaws is (oh yes, I have many. Not a Shakespearean heroine to have just one!) I keep quiet in situations where I know I should have spoken. Keeping quiet is my undoing. But I keep quiet, nonetheless. And regret it to eternity! I keep quiet when a friend or family member or even an acquaintance (just realized that the category ‘friends/family/acquaintances’ – practically covers the entire world) hurts me or says mean words, or throws sarcastic comments, or insults, or generally behaves badly. I keep quiet thinking, if I speak, things will turn ugly; there will be a full blown war and the relationship will end. I know. I know. It is a stupid logic. It never works. That is why it is my most potent flaw. I keep quiet till I can keep quiet no more. No more could be in terms of months and years! It depends - a) on the person or the kind of relationship I share with him/her: close family/dear friend/close friend or colleague of the spouse b) how long have I known the person: couple of meetings, random encounters, or repeated interactions. I keep quiet for so long that I can’t take it any longer. It’s too much negativity to take in. I lose sleep over it. I think I got this trait from my mother. Or it’s just that we both are Aquarians. According to Sigmund Freud “unexpressed emotions never die. They are buried alive and will come forth later in uglier ways. An outburst of anger is the outward expression of inner pain that has been silenced for far too long.” Trust the experts. He is right. All that buried frustration and pent up anger just explodes like a volcano one day. And then, what I feared the most, all along, from the first instance, actually happens. The relationship ends. For the longest time, I thought why did I leave behind so many friends and why did so many leave me? The blame falls on me for the end. I become the ‘bad’ person who spoilt a good thing. The silence costs me my name and my respect. But I never learn. Another relationship, another hurt, another silence, another outburst. A research states that humans are wired to forgive. It is a problem. This ‘maaf kardo’ mind-set is why some people continue to stay in bad relationships. Humans have a tendency to give others a benefit of the doubt. We forgive even when we have evidence that they don’t deserve it. We do so because people sometimes behave badly by accident. We think we may be mistaken. If we act on negative impressions too soon, we might miss out on the many benefits of social connection and end a relationship abruptly. Now, that’s some strong research backing my character flaw!